Duncanby Lodge. 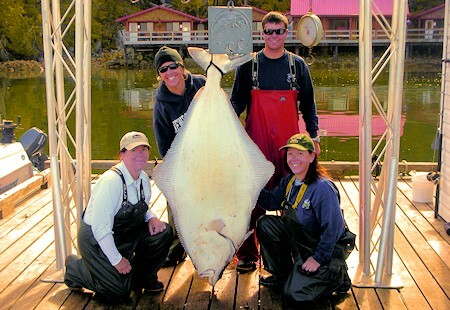 BC Salmon Fishing Resort, Rivers Inlet, British Columbia, Canada. Guided Salmon and Saltwater Fishing. Waterfront Lodging. Friends, welcome to Duncanby Lodge. 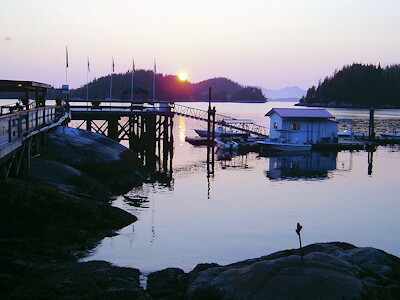 This bountiful fishing paradise matched with the breathtaking beauty of the BC West coast, is truly a sight to behold. 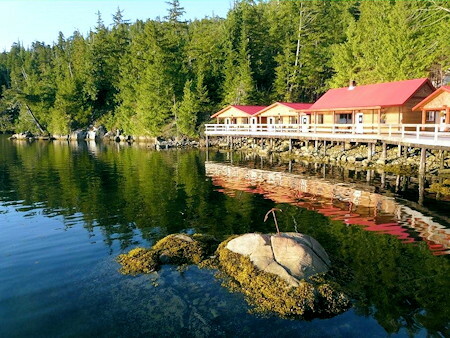 Beyond the splendor of our surroundings, Duncanby Lodge in Rivers Inlet, on the Central Coast of British Columbia, offers a level of outstanding service and amenity quality that is unparalleled by any other fishing resort. For years Rivers Inlet has been made famous as a place to share the thrill of hooking a monstrous Chinook salmon on a rod and reel. 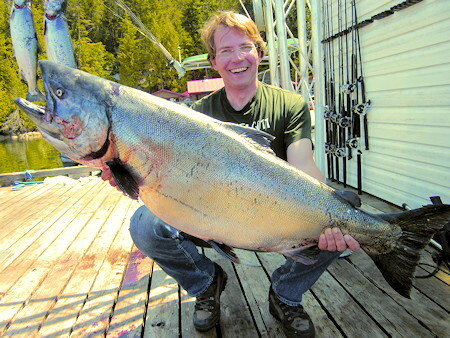 The Inlet continues to produce enviable salmon runs where Chinook salmon have been known to top the scale at 80+ lbs. Coho are considered the best action fish in Rivers Inlet. We are fortunate to have our Inlet filled with blue back Coho from mid June to early August. By mid July the northern Coho begin to appear and continue to increase in size and numbers until they seem to monopolize the ocean by the last week of August. We are also fortunate to have a variety of bottom fish including halibut, ling cod, red snapper (yellow eye rockfish), and rock cod all season long. 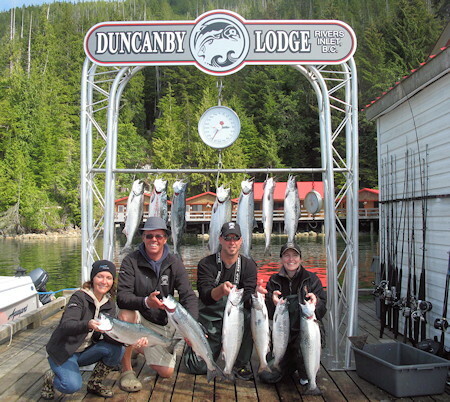 If you are an inexperienced sportsman you needn't worry, Duncanby offers guiding service with highly qualified and personable guides that will help make your experience on the water a memorable one. Built in 1936, Duncanby Landing, as it was called for years, was the center of a once thriving logging community on the central coast of British Columbia. 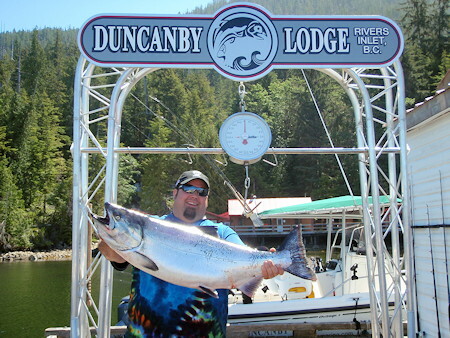 Duncanby has since modernized into a leading all-inclusive fishing resort. Our first rate amenities have all of the luxuries and conveniences you would expect at a major metropolitan resort, while being surrounded by the natural simplicity of Rivers Inlet. The comfortable heated cabins nestled on the waterfront feature duvet-covered queen size beds, bunk beds, full ensuite bathrooms, and daily maid service. For our larger groups, Eagles Nest (two bedrooms and loft) and Graham House (four bedrooms) have private lounge areas with satellite TV. After a great day on the water we invite you to relax on our patio with your favorite beverage in hand, or the main guest lounge with comfy leather couches and a big screen TV. Duncanby also features a waterfront hot tub to ease your muscles and enjoy the scenery. The region surrounding Duncanby is home to an abundance of BC wildlife. 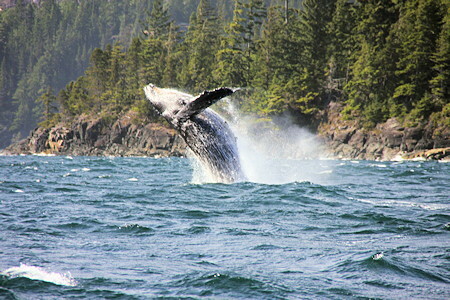 Whether you are having a dockside cocktail, or out fishing in the Inlet, you'll be sure to see the magnificent humpback whales that frequent the area. Bears are also a common sighting in the region, often roaming the shoreline or catching salmon in the river estuaries. If you have limited out on your salmon and halibut for the day, a great afternoon can be spent in a kayak, taking in the sights as you paddle around the nearby island chains. At Duncanby Lodge there are no set meal times and guests are free to eat when and what they want. Jessie's Place Restaurant offers an eclectic menu that uses the finest ingredients and products flown in from Vancouver twice weekly. Our chef's passion and dedication to their craft are what make the dining experience at Duncanby superior to anything you've ever experienced at a fishing resort. and that is because we love doing it. Our mission is simple; to provide an experience that goes above and beyond our guests expectations. We thank you for showing interest in Duncanby Lodge and cordially invite you to join us to experience the Duncanby Difference.